GlutenFreeWatchDog is the "Consumer Reports" of gluten free food. Her most important conclusions are found here. 2019: Lentils labeled gluten-free containing errant foreign grain with test results and pictures of the gluten grains contained in the packages. ​Download the pdf and see Table 1 on pages 26-27. Tested 300 foods labelled “gluten-free” that are most commonly purchased in Australia. Found that 2.7% of foods labelled “gluten-free” were not compliant with the Australian national standard of no detectable gluten; two contained gluten at levels exceeding the less strict Codex Alimentarius CODEX (Europe) and Food and Drug Administration (United States) thresholds for “gluten-free” labelling (20 ppm). 2018: The new Gluten Detective home test was used to determine the amount of gluten consumed by those on the gluten-free diet. Here is a blog post by GlutenFreeWatchDog explaining the results, and the original research is here: Determination of gluten consumption in celiac disease patients on a gluten-free diet. 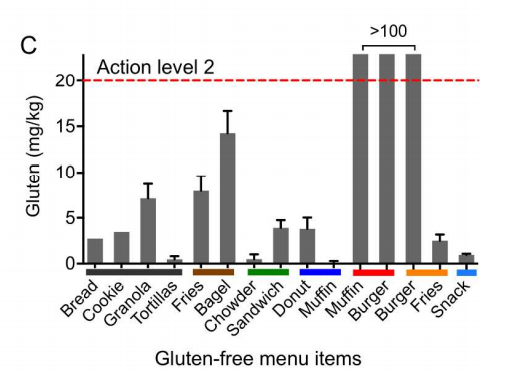 2017: Image below is from this article: Integrated Magneto-Chemical Sensor For On-Site Food Allergen Detection, and shows the test results for 15 gluten-free menu items from 7 different restaurants. The results are given in mg/kg which is the same as parts-per-million (ppm). 2016: Improved Quantitation of Gluten in Wheat Starch for Celiac Disease Patients by Gel-Permeation High-Performance Liquid Chromatography with Fluorescence Detection (GP-HPLC-FLD). 2016: Gluten levels in products NOT labeled gluten-free but appearing to be free of gluten ingredients 13% of these products contained detectable gluten. (Testing data is from GlutenFreeWatchDog which tests products suggested by subscribers as having possibly caused a reaction, so there is sample bias). In this analysis, labeling information compiled for 101 products tested for gluten content through Gluten Free Watchdog, LLC was retrospectively reviewed for an allergen advisory statement for wheat, gluten or both (for example, Made in a facility that also processes wheat). Products reviewed for this analysis were not labeled gluten-free but appeared to be free of gluten containing ingredients based on a review of the ingredients list (that is, no wheat, barley, rye, malt, brewer’s yeast). Of the 87 products that did NOT include an advisory statement, 13 contained quantifiable gluten at or above 5 ppm including 4 products that tested at or above 20 ppm of gluten. Of the 14 products that DID include an advisory statement, only 1 contained quantifiable gluten at or above 5 ppm. (Note: This may not have been a random selection of products as they may have been tested based on a consumer's suspicion that they contained gluten). The Canadian Food Inspection Agency tested 268 samples of ground spices and found that 24% contained detectable levels of gluten. The test results are listed at the end of the article in Appendix I. Contamination was common in "naturally" gluten free grains (such as millet, sorghum, etc) that are not labeled gluten-free. A gluten free label correlated with less contamination. How gluten-free is your flour? In a paper by Collin, et al 17 of 59 , or 29% of products labeled "gluten-free" contained levels from 10 to 200 ppm gluten. The tested items were the most commonly-used European GF products and were not made with wheat starch. A study by Lardizabal showed similar results in American products. In the process of validating a test for gluten in foods, Valdes tested 3,088 "gluten-free" foods, commercially available in Europe. They found that fifty-five percent of the samples contained detectable gluten (>3.2 ppm). Thirty-five percent of these "GF" foods contained more than 20 ppm; ten percent contained more than 100 ppm; and six percent contained more than 200 ppm. These results are not directly applicable to American GF products because the "gluten-free" products tested in this study were purchased commercially from European countries. Codex Alimentarius wheat starch is often used in "gluten-free" products in Europe (but not the U.S.), so this is the source of some of the contamination. Unfortunately they did not break down the results by wheat-starch vs. non-wheat-starch-containing products. GlutenZap If you join this forum there is a private area that you can request access to, which has a list of test results. Testers in this forum are looking for low levels of cross-contamination and using unvalidated testing methods.